The lighthouse of Alexandria (or The Pharos of Alexandria, Greek: ὁ Φάρος τῆς Ἀλεξανδρείας) was a tower built in the 3rd century BC (between 285 and 247 BC) on the island of Pharos in Alexandria, Egypt to serve as that port’s landmark, and later, its lighthouse. With a height variously estimated at between 115 ~ 150 meters (377 ~ 492 ft) it was among the tallest man-made structures on Earth for many centuries, and was identified as one of the Seven Wonders of the World by Antipater of Sidon. It may have been the third tallest building after the two Great Pyramids (of Khufu and Khafra) for its entire life. Some scholars estimate a much taller height exceeding 180 meters that would make the tower the tallest building up to the 14th century. On our third day in Egypt, we drove north to Alexandria. 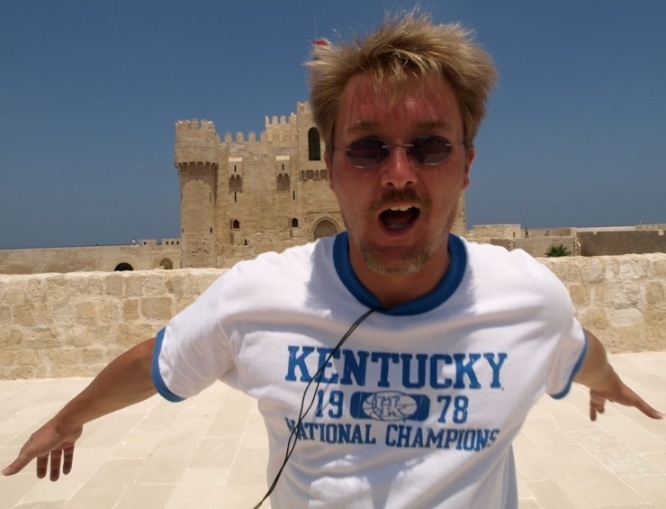 One of the sites that we visited was the Qaitbay Citadel. Established in 1477 AD by Sultan Al-Ashraf Sayf al-Din Qa’it Bay, this Islamic sea fortress guards the bay of Alexandria from foreign invaders. In it’s day it was the premier defensive stronghold on the Mediteranean. And for good reason, European conquerors from Alexander to Ceaser had landed at Alexandria and taken Egypt throughout the ages. The good Sultan wished to dissuade other foreign adventurers from attempting the same. A few centuries later, Napolean would land and take Egypt for the New French Republic/Empire. That would signal the definitive and final conclusion to Muslim dominance of the Mediteranean and North Africa. The Citadel sits on the site of the famed Lighthouse of Alexandria and is actually built from blocks that are left over from the Lighthouse. On the inside, there are columns and large granite blocks that were taken up from the grounds and used as foundation, portals and entryways. The citadel is large and formidable in appearance. Not a bastion that I’d look to storm with swords, muskets or 17th and 18th century canon. It is a magnificent structure with the history of the ages writ upon it. Think on it. The lighthouse itself was built by Ptolemy to stimulate trade in Egypt. Even so. Alexander, Cleopatra, Ceaser and Napoleon are but a few historic figures who have walked upon the shores of Alexandria and either the ramparts of this fort or the hallways and ruins of the Lighthouse. Great drama in the histories of man have been witnessed by these monuments of man. The Citadel is situated at the entrance of the eastern harbour on the eastern point of the Pharos Island. It was erected on the exact site of the famous Lighthouse of Alexandria, which was one of the Seven Wonders of the Ancient World. The lighthouse continued to function until the time of the Arab conquest, then several disasters occurred and the shape of the lighthouse was changed to some extent, but it still continued to function. Restoration began in the period of Ahmed Ibn Tulun (about 880 A.D). 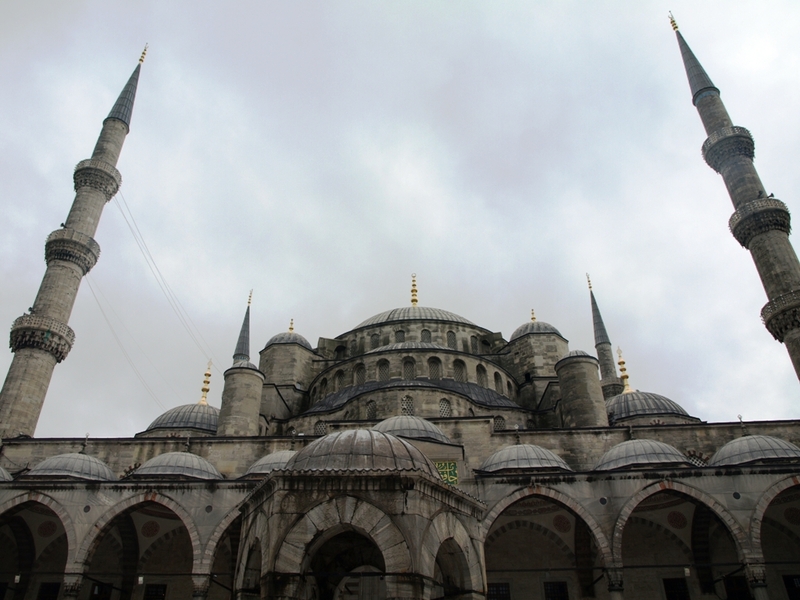 During the 11th century an earthquake occurred, causing damage to the octagonal part. The bottom survived, but it could only serve as a watchtower, and a small Mosque was built on the top. In the 14th century there was a very destructive earthquake and the whole building was completely destroyed. We spent a day in Alexandria. We tooled around town for a bit. Walked around the bay. Visited Pompeii’s Pillar. The new library of Alexandria. The catacombs under the city which date back to Cleopatra. The Alexandrian Coliseum and a few other places. We took a lunch break and headed back to Cairo to take the ten hour overnight journey by train that would take us to Luxor and the ancient Temples of Thebes and ultimately to Aswan and Abo Simbel. The beginning of an incredible adventure for Becca and me.